Chemiluminescence (CL) is defined as the emission of electromagnetic radiation caused by a chemical reaction to produce light. Chemiluminescence immunoassay (CLIA) is an assay that combine chemiluminescence technique with immunochemical reactions. Similar with other labeled immunoassays (RIA, FIA, ELISA), CLIA utilize chemical probes which could generate light emission through chemical reaction to label the antibody. In recent years, CLIA has gained increasing attention in different fields, including life science, clinical diagnosis, environmental monitoring, food safety and pharmaceutical analysis because of its high sensitivity, good specificity, wide range of applications, simple equipment and wide linear range. CLIA have three different label systems according to the difference of physical chemistry mechanism of the light emission. This kind of chemical with special structure can transfer to an excited state through chemical reaction. Photons would be released when the chemical fell to ground state from the excited state. The typical chemical is acridinium ester and its derivatives. Exposure of an acridinium ester label to an alkaline hydrogen peroxide solution triggers a flash of light. A subsequent development has been the acridinium sulfonamide ester labels. It is also triggered by alkaline hydrogen peroxide to emit a flash of light. The light emission mechanism of acridinium ester is shown in Figure 1. Figure 1. Mechanism of acridinium ester mediated chemiluminescence. Acridinium labeled compounds have 100 times stronger chemiluminescence intensity compared to luminol labeled ones, and acridinium esters have the dominant feature that they do not lose the luminescence efficiency even after binding to antigen or antibody. And the chemistry is simple that no enzyme needs to be involved. This type of chemiluminescence utilizes enzymes to label antibody. Technically speaking, it is an enzyme linked immunoassay that uses luminescent chemical as substrate instead of chromogen. The most widely used enzymes are horseradish peroxidase (HRP) and alkaline phosphatase (AP), each has its own luminescent substrates. Figure 2 shows the detail about HRP-Luminol system (Figure 2 a) and AP-AMPPD system (Figure 2 b). Luminol is a very common chemiluminescent substrate used for detection of HRP. HRP catalyzes the decomposition of luminol in the presence of peroxide to produce an excited state intermediate. Flashes of visible light (maximum at 425nm) is emitted on decay of the singlet intermediate. AMPPD is a derivative of 1, 2-dioxetane substrates. It has a similar mechanism of chemiluminescence. On enzymatic cleavage of the phosphate group, this compound becomes destabilized and decomposes via an intermediate anion, AMPD, which is moderately stable. The wavelength of maximum light emission is 470nm. Figure 2 Mechanism of Luminol-HRP (a) and AMPPD-AP (b) chemiluminescence system. Another CL system is noteworthy because the reagent is regenerated and thus can be recycled. 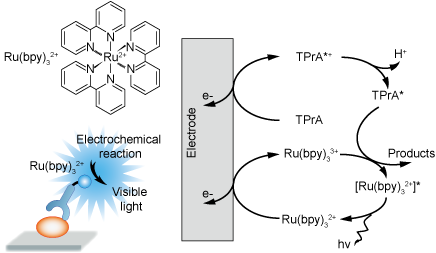 This system utilizes ruthenium tris-bipyridine (bpy) as label, involves reaction of Ru(bpy)33+ and Ru(bpy)3+ to produce an excited state of Ru(bpy)32+, a stable species which decays to the ground state by emitting an 620 nm orange emission. Ru(bpy)33+ and Ru(bpy)3+ can be electrogenerated from Ru(bpy)32+ by reduction at approximately -1.3 V, and oxidation at approximately + 1.3 V (Figure 3) . This system is dedicated for electrochemiluminescence with ultrahigh sensitivity and specificity. Figure 3. Mechanism of Ru(bpy)3 electrochemiluminescence system. Chemiluminescent methods are now established in routine clinical analysis and serve as tools in clinical and biomedical research. Many clinical laboratories perform routine immunoassay and nucleic acid testing using chemiluminescent systems. Chemiluminescent blotting is widespread in research laboratories, along with a wide variety of other chemiluminescent assay techniques. The scope of chemiluminescent assays continues to expand. For many years, Creative Diagnostics has been supporting the life science industry with a full range of the highest quality antibodies, proteins, hybridomas, rapid test, and diagnostics kits. To further enable innovative biomarker development for different fields, we offer highly customized Chemiluminescent Immunoassay Development solutions to meet your basic, applied and clinical research demands. 1. Kricka L J. Clinical applications of chemiluminescence[J]. Analytica chimica acta, 2003, 500(1): 279-286. 2. Vo-Dinh, T. 2003. Chemiluminescence. Encyclopedia of Applied Physics. DOI: 10.1002/3527600434.eap063. 3. Wang Y F W, Kobayashi M. Antibody Detection: Principles and Applications[M]//Advanced Techniques in Diagnostic Microbiology. Springer US, 2013: 53-73. 4. Chen W, Jie W U, Chen Z, et al. Chemiluminescent immunoassay and its applications[J]. Chinese Journal of Analytical Chemistry, 2012, 40(1): 3-10.